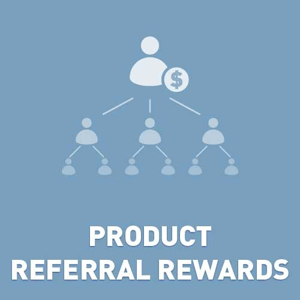 Product Referral Rewards allows administrators to configure their nopCommerce installation to offer reward points for product referrals AND to allow referrers to send their friends a coupon code towards their first purchase! The plugin allows you to configure the number of points to reward your referrers with and to specify which coupon code should be sent to their friends. Admins can choose to require that the referrer have previously purchased the same product they are referring, and can also enable/disable the referral system for any product(s) they choose. Included is the ability to display a special message in various widget zones on product pages, as well as an animated pop-up message to display on your home page. This allows you to tell customers about your incentives for referring friends. Admins can track the number of referrals and reward points awarded to each referrer, and customers can track their own product referrals from within their account. Admin wants to increase strong referral sales of ONLY the iPhone5. Admin enables the plugin for the iPhone5. Admin creates a special coupon for a discount on the iPhone5. Admin gives referring customer reward points for his referral, but ONLY if the referring customer has previously purchased the iPhone5 from his store, and ONLY if the friend purchases the iPhone5. Admin wants to increase referral sales of all products in his store. Admin enables product referrals for all products and creates a discount coupon which can be applied towards any/all products. Admin gives referring customer reward points for his referral whether he has purchased the product he is recommending or not, and regardless of which product(s) their friends buy. Not registered version is fully operational. It has only one limitation. Only 50 customers will receive rewards points. Try before buying. Compatible with NopCommerce 4.10, 4.00, 3.90,3.80,3.70, 3.60, 3.50, 3.40. + released version for nop 4.00. - fixed small bug (socialization message showed for each productdetails_bottom zone).